When George Mayer bought the farm, it was his aim to make olive oil, notwithstanding the lack of olive trees on the farm. Today the farm has approximately 2500 olive trees, which were planted in May 2008, bar about 220 which went in May 2005, and which are providing their 3rd pressings in May 2010. The majority of the trees planted are Frantoio, with liberal sprinklings of Corantino, Lecchino, and Mission. The oil produced to date has been of excellent quality. We’ve started with our own olive pressing on the farm already and now our Olive Oil is available in Johannesburg. Our 2011 harvest has won us a Silver award with the South African Olive association. A Cold Pressed, Extra Virgin Oil, has lovely peppery, fresh cut grass flavours, which makes it a lovely versatile oil to use for cooking, dressings, dipping in warm ciabatta breads, or drizzling over pastas for that extra je ne sais quoi. A Cold Pressed Extra Virgin olive oil, with a pungent pepper flavour. A smooth well-balanced acidity. One for the olive oil lovers. 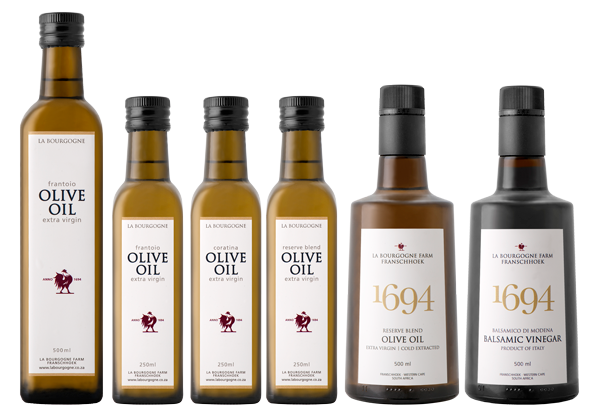 A lovely, fresh, Cold Pressed Olive Oil, beautiful to use for dressing as well as for cooking. This creamy, smooth Cold Pressed Extra Virgin olive oil, is a blend of 4 cultivars from our farm, It’s beautifully blended to give you a great table olive oil. Made from our homegrown mission olives, the olives are picked and sorted by hand. They are then submerged in a 10% saltwater solution in a period of 6-7 months. During the 7 months they are checked and solution is refreshed. This procedure is done to extract the raw bitterness out of the olives. When the Olives are ready and the bitterness is gone we sort and soak the olives in fresh water to extract the salt taste. Then from there we bottle them in 250g jars in a vinegar/salt/ water solution together with our magic touch of fresh farm ingredients. Unopened these olives can last up to 6 months in the jars.